I’m a sucker for those food trucks. I have no idea why, but the process of getting something made in a mobile restaurant just fascinates me. It’s probably because for the most part, it’s all comfort food that’s good for the soul but not quite as good for the waistline. In the Dallas Fort Worth area, we have several food truck parks and the popular theme is all things Asian. Food trucks introduced me to the Banh Mi and now they’ve introduced me to Larb. I pronounce it just as it reads, but I do wonder if maybe it’s not as it appears. LOL, maybe the “b” is silent and I just sound silly. Hmmmm. So, what is larb? It’s actually a Thai version of street food. Like those street tacos that you can get, but this is salad form. 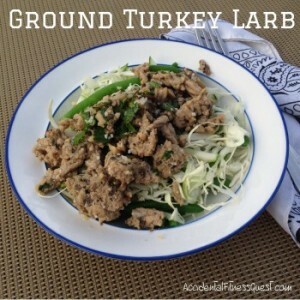 Larb is a spicy ground or minced meat salad that is popular in Thailand or Laos. It’s got crunch, spice, coolness, meats, veggies, and is pretty freaking tasty. I tried to play around with ingredients that I saw in the larb that I got to come up with my own. Obviously it’s not going to be exact nor authentic, but it was still really good made with ground turkey, spices, and other veggies. I used a bit of finely chopped mushrooms to add more meaty texture without the meaty calories. I also got to use real basil from my own backyard for this one. Score one for me! Dice the mushrooms until they are pretty finely chopped. Add the mushrooms and ground turkey to a pan and heat over medium heat. Cook the turkey and mushrooms for about 7 – 8 minutes until no pink parts remain and the turkey is cooked thoroughly. Remove from heat. Chop the fresh cilantro and basil. Pulse the rice in a Magic Bullet or food processor until finely ground. Mix the dressing ingredients in a small bowl. Add the herbs and rice to the meat mixture. Drizzle on the dressing and toss to combine. Toss the salad ingredients in a bowl and divide evenly onto 4 plates. Top with the meat mixture and a slice of lime, if desired. Makes 4 salads at approximately 240 calories each – 26g protein, 17g carbs, and 8g fat. I used Thai chili paste since that’s what I saw first in the fridge and wanted to add spice. You can also use sriracha instead or about 3 diced Thai bird chilis. You just want a little spice to the dressing to make it fun. You want the green beans to have some crunch to them so I didn’t cook mine. I had a bag of frozen green beans for this recipe. I measured out what I needed and just tossed them into the salad while the meat cooked. The warmth from the meat and waiting slightly thawed them without any problems. You can also thaw them ahead of time if you like. Grinding the rice in the food processor makes it very fine and more of a crunchy rice topping instead of using something like fried wontons or chow mein noodles. Pretty inventive. So go forth and enjoy your larb. I’m on the lookout for more food trucks so I can remake a few more recipes.